We have been struggling for years with our back sliding door. The rollers were shot to bits, and we got to the stage where we practically had to lift the door to open it. My wife particularly struggled opening and closing it. I decided I had to do something about it. So, I jumped onto my computer and happened to come across Adsafe’s website. I watched his online videos and read a number of testimonials, and was so impressed that I decided to ring them up to get a quote. I spoke to Stephen who sounded very genuine and down to earth. He asked me a few pertinent questions to determine the extent of my sliding door issue and gave me an upper and lower range quote. Certainly a lot cheaper than having to replace a door I must say. So, I booked an appointment with him. He and his assistant (Jessie) turned up right on time and spent a good hour or two working on the door. I seriously could not be happier with the result. It glides like a brand new door. To top it off, Stephen charged me “below” the lower range price because they managed to salvage the track and used good quality parts that come with a 5 year guarantee. Stephen and Jessie, thank you so much for your professionalism. It was such a pleasure to meet you both. 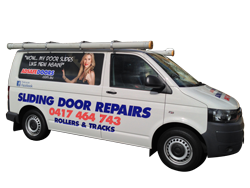 For anyone who is thinking about getting their sliding door repaired, I highly recommend Adsafe Doors.